Daylight quality and quantity in Algerian schools show serious problems in ensuring visual comfort of students and teachers. Some problems are due to window design, which leads to excessive amount of sunlight penetration into the classrooms. The consequences are glare and heat gain. This study investigates the effective glazing pattern for classroom to achieve optimum daylight performance and visual comfort in Algerian classrooms. Field measurements of typical classrooms were carried out in a selected school in Algeria during solstice summer (under clear sky condition) and solstice winter (under overcast sky condition). The data of outdoor daylight illuminance were used to validate Integrated Environment Solution Virtual Environment (IESVE) daylight simulation. This study used three different glazing types, namely, clear, tint and reflective glass with different glazing proportions, subsequently, seven patterns of glazing window design were used for an extensive simulation exercise. The results of the investigation from the site measurements show that the work plane illuminance was found to be beyond the range of 300 lux to 500 lux, which exceeded recommended value, except for the south-east orientation with clerestory typology, which were recorded at 2.98% of daylight factor, in contrast the daylight uniformity in tested classrooms is appropriate. Furthermore, the simulation revealed that combination of 75% clear glass and 25% reflective glass with 30% wall-to-window ratio has achieved 41.41% during winter and 47.82% during summer of Useful daylight illuminance. The use of different glazing configurations shows a significant improvement on daylight distribution and the reduction of glare comparing to the reference model. However, such improvement in the quality and quantity of daylighting was inadequate which arises the need of further enhancement. The study of the comfort in architecture, building conditions, and environmental needs of the society has become paramount . This arises the need of proper environmental monitoring and in-depth analysis of building performance that influence societal wellbeing. The current state of schools in Algeria is such that there is an urgent need for building new schools to meet the needs of increasing school standards in accordance with the times. However, few of these schools meet the minimum norms based on design criteria for conducive learning thus there is a need for urgent improvements to remedy the many problems constantly suffered by school children. These problems are caused by poor visual environmental for learning conditions through a large amount of daylight penetration inside the classroom that causes glare and non-uniform daylight . Visual comfort is the main determinant of lighting requirements. Good lighting will provide a suitable intensity and direction of illumination on the task area, appropriate colour rendering, and the absence of discomfort . In addition, it provides a satisfying variety of lighting quality and intensity . Hence, the relationship between lighting levels and visual comfort is generally strong, in order to achieve high visual performance . The activities carried out by students in the classroom differ, therefore, the lighting condition in the classroom should suit the activities practiced by the students . The performance of daylight in classrooms requires many daylight metrics for assessment. The illuminance-based metric is commonly used to measure daylight provision . Thus, it can be defined as the amount of light reaching the surface or at a specific point in a work plane within a specific point in time, normally expressed in lux (lm/m2) . The average daylight factor (DF) represents the architectural quality of buildings and is one of the most widely used simulation outputs. The DF is a common method that determines the availability of daylight in a room [9,10]. The DF is expressed as a percentage and is defined as the ratio of interior illuminance on a horizontal surface E(int) to the exterior illuminance on a horizontal surface E(ext) under standard CIE overcast sky conditions. By definition, DF should be calculated only under the CIE overcast sky condition. This is critical for the understanding of the final simulation results. In contrast, The Sunlight illuminance ratio (SIR) is the interior illumination on a horizontal surface over the exterior illumination on a horizontal surface in a clear sky condition . Furthermore, a far more realistic account regarding true daylighting conditions is provided by dynamic daylight metrics when compared with the highly idealised DF method. Reinhart & Wienold in (2011) had written a review on the recent dynamic daylight metric advances (climate-based), and remarked that the most commonly used approach was Useful Daylight Illuminance (UDI) [12,13]. Exceed the useful range (i.e. greater than 500 lux). To achieve the desired daylight and view in any building design, prompt attention is given to the building orientation, position of windows, size of windows and glazing type . Modern window design transcends beyond provision of simple windows with visible transmittance into more complex division . The first division handles daylight glazing by deflecting direct light beams incident into the building through light shelves, reflective blinds, or other reflective surfaces. These glazing are placed high in the wall or ceiling. The second division glazing is at the lower part of the wall level for occupants of the space to enjoy the outdoor view. These divisions can be improved by addition of glazing to mitigate glare and solar heat gain [21,22].The vast amount of glazing types in the market affords the architect multiple options in specifications for window glazing. The factors for the specifications includes window orientation, thermal and acoustic characteristics, main functions of the window in introduction of daylight and provision of adequate views to the occupants ; however, this study focuses on the available glazing in the Algerian construction market and the frequency of usage within the school construction typologies . Several studies on the quality and quantity of daylighting have been conducted to provide the needed visual comfort for learners in school buildings [24-27]. This is hinged on several factors such as student performance [28,29]; and appropriate design through different approach such as shading devices [30,31]; windows design that allow the use of natural sun light for illuminating the classrooms [32,33]. However, only few research focus on optimization of daylighting quantity and quality through glazing configurations of bilateral and clerestory window typology, therefore, this research aims (1) to generate significant information to serve as a platform for daylighting requirements for classroom building design, and (2) to determines the optimum glazing pattern to maximise daylight, and occupant comfort. The methodology used in this study is a combination of two methods. The first is site visit and experimental measurement in a selected Algerian school as case study, followed by computer daylight simulation experiments using work plan illuminance, DF and dynamic daylighting illuminance metrics through Integrated Environment Solution Virtual Environment (IESVE) software. A typical classroom, which was derived from a typical Algerian public school, was modeled for a simulation exercise. 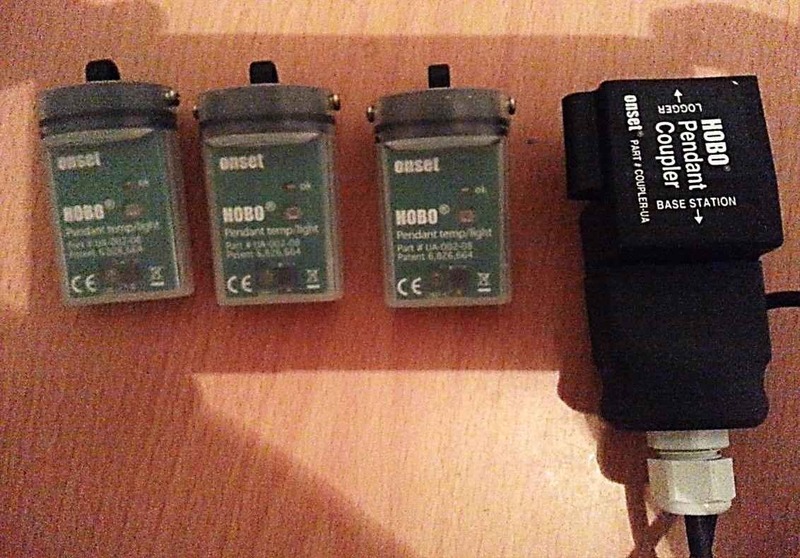 The measurements of illuminance levels and DF were performed by using three light meters (HOBO Pendant Temperature/Light Data Logger), as shown in Fig. 1, in critical periods (summer and winter season). Fig. 1. Data-logger and three light meters used in the experiment. The schools chosen for conducting this experiment are located in Algeria, where the Mediterranean climate is characterized by cold winters as well as hot and dry summers. Extreme temperatures range from 1.7C in January that is considered the coldest month to 34.5C in July, which is the warmest month in the year. This experiment conducted for two typologies: (1) a linear configuration with simple distribution (Bilateral lighting mode), and the linear configuration with double distribution (clerestory lighting mode), which are representing the common school’s typology. The classrooms are usually occupied from 8:00 h. to11:00 h. in the morning and from 13:00 h. to 17:00 h. in the afternoon, illuminated on two opposite sides (bilateral clerestory lighting) through a window size of 30% wall-to-window ratio (WWR). The external facades of three tested classrooms facing to north, south, and west orientations, as shown in the Fig. 2. Referring to the type of glass used in this school, the predominantly used in most schools is single clear glass 3mm with U-value of 5.25 W/m2K, and visible transmittance 92%. Fig. 2. 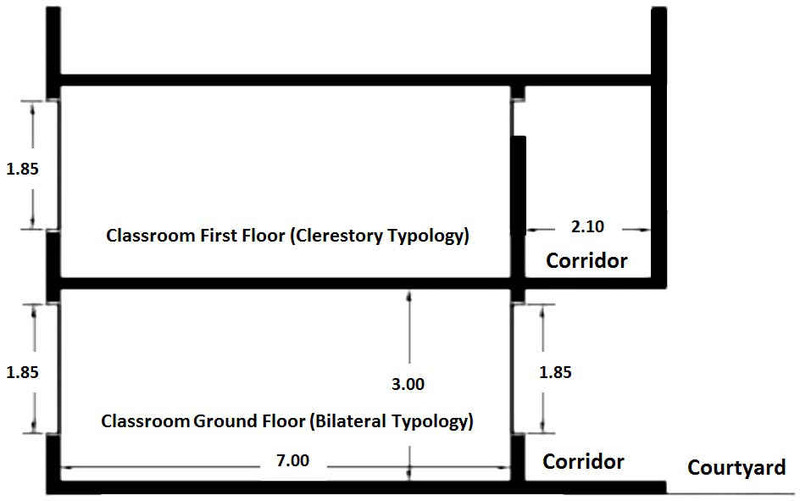 (a) The location and orientations of classrooms tested, (b) bilateral typology with overhang, and (c) clerestory typology without overhang. Series of daylighting measurements were performed both inside and outside of the classrooms in order to measure the illuminance. Outside the classroom, an external sensor was placed for each measurement, thus obtaining the external illuminance (Ee) for each analysis while measuring work plane illuminance (WPI) inside the classroom (Ei) by a number of grid points depend on the position of each classroom at work plane height of 75cm above floor. These measurements were performed within a critical period in summer (22 July) and winter season (22 December), at 9:00 h. in the morning and 14:00 h. in the afternoon. The choice of measurement points (grids) inside the classrooms followed the grids plotted according to the (disposition) arrangement of work planes (tables) and side openings  (Fig. 3). The minimum number of points in the prototype classroom in Algeria was 48 points. For accurate results, the distances between measurement point grids were made to be 1 m . It is important to remember that the goal of this part of the research was too evaluate the daylight quantity thus student attendance was not necessary. Fig. 3. (a) Grids of measurements, (b) arrangement for the experiment within classroom, and (c) visible coating of window. After completing these measurements, the internal WPI values were transcribed into a tabular form which contains the average illumination of each column, the overall average illuminance of the classroom, and the uniformity index (Iu) of interior daylight; which is the the ratio between the minimum illumination to the maximum illumination should be no less than 0.5 above the WorkPlane based on NBN L13-001 code and international guideline . All these variables were calculated by using Microsoft Excel. For quantitative analysis, we conducted a comparison of the resulting values of measurements with lighting standard recommendations . The tools of daylighting simulation have been increasingly applied to determine daylight conditions in many studies. Most of these tools employ CIE sky models for simulation. Nevertheless, the applicability and accuracy of these tools for a typical Algerian climatic condition need validation as the climatic conditions varies with the software coming from other countries that are not in same climatic region as that of Algeria, which is a Mediterranean climate. This study validated IESVE software result with outdoor illuminance measured under real sky conditions. All measurements were conducted in Algeria under clear and overcast sky conditions and outdoor illuminance data extracted from the middle of each month (October, November, and December in winter, and July in summer) were compared with IESVE values. Means Bias Error (MBE) and coefficient of determination used for validation. Algeria is located at 36.4°N 3.02°E and possesses an average elevation of 186 meters. The location provides lots of daylight throughout the year due to its latitude and longitude coordinates. Therefore, it is preferable to utilise daylight in the buildings during daylight hours, which is available in abundance and free. The daylight performances can be affected by the surrounding environment of the site . However, in this research, the reflection from the surrounding environment was ignored. In Algeria, as in most European countries, the fully overcast sky has been selected as standard design sky to which DF is employed in daylighting design as it represents minimum daylight condition. However, the overcast sky is representing the least favorable lighting condition in many regions .Weather stations provide indices of total cloudiness (duration of sunshine (hours) and global solar radiation in (Wh/m2), but they do not measure illuminances. For this reason the various existing global daylight availability across the country have not been defined on the basis of actual measurements. Fig. 4. (a) and (b) Geometric 3D Model typology of Typical Classroom (bilateral lighting mode) used in simulation. It is assumed that there is no building in the vicinity that could obstruct direct light from entering the windows. The design considerations for windows in classrooms require examining climate and solar conditions which are affected by the location and building type. Therefore, several design variables can strongly influence the impact of windows on visual performance and the learning environment. The daylighting system adopted in Algerian public schools is bilateral lighting which means the openings exist on two perpendicular walls. Therefore, the opening of the windows will be designed on both walls; square shaped windows are commonly and widely used in Algerian public schools. Window sizes were modelled with a fenestration inclusive of window frame with WWR of 30% as constant, in accordance with Algerian guideline recommendations. Table 1 shows the glazing configurations applied for this study (simulation), ratios of glazing type used were: 25%, 50%, 75%, and 100%. To balance daylight admission with glare and solar heat gain control as well as providing uniform light distribution, modern daylight design suggests that glazing is separated into glazing for daylighting and glazing for views [39,40]. For the use of bilateral lighting, reflective and tinted glasses are applied in the top part of windows in order to moderate the penetration of high angle sunlight  and to prevent the direct sunlight that causes glare, especially in summer. The clear glass is also applied in the lower part to maximise the view. In this study, seven patterns of glazing configurations were simulated through both axis (North-South and East-West) at 9:00 h. and 14:00 h., however the view glazing part was constantly using clear glass. Table 1. Glazing configuration size and position used in simulation. To study the potential of daylight utilisation, the DF, SIR, and the WPI were considered the most appropriate factors for indicating the quantity of daylight admitted-in and the effectiveness of the illumination on the system in both overcast and clear sky conditions, in addition to uniformity of daylight inside classrooms to achieve visual comfort. Due to the unique convergence of a similar climate between Algeria and France, it draws the need to build the results of this study with the stipulations of the French guidelines. The regulation of daylighting in schools is different from one country to another. However, The French Association of Lighting and Community (A.F.E) provides recommendations and regulations for school buildings , thus the performance indicator of French Standard (A.F.E) was selected, as shown in Table 2. Furthermore, the Isolux diagrams present the spread and penetration of daylight inside the classroom with contour lines in order to show better graphical understanding for each windows configuration. However, the optimum glazing design identified based on; (1) the average illuminance distribution and DF (2) The maximum percentage of UDI300-500 lux with minimum percentage of UDI>500 lux. Table 2. Summary of Performance Indicator Criteria for Daylight Simulation Experiment (AFE, PROMOTELEC). 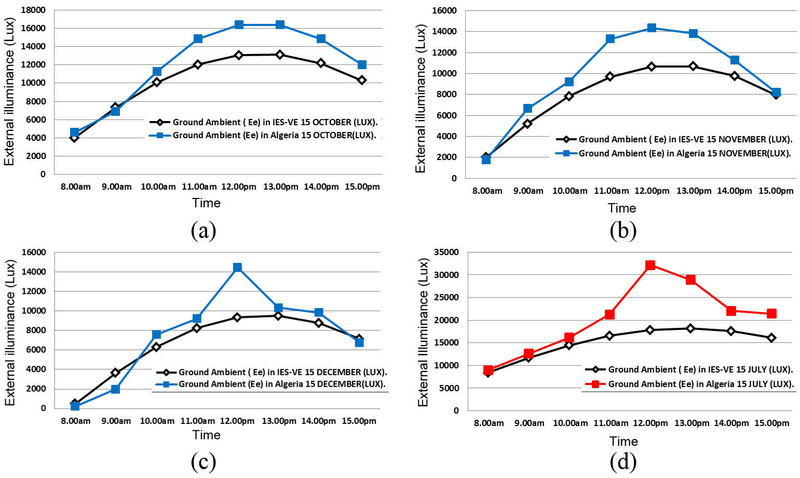 Figure 5 shows the comparison between IESVE outdoor illuminance and Algerian outdoor illuminance measurements in the months that represent critical period (15th of July, October, November, and December). The results were simulated and cross-examined to denote a better comprehension of the prevailing conditions in the Mediterranean. From this study, the Mean Bias Error (MBE) and coefficient of determination (R2) indicators employed for validation stage. The measured outdoor illuminance under the skies of Algeria was somewhat higher when compared to the simulated data; it had almost steady fluctuations of less than 18 klx under CIE standard sky and 35klx under sunny sky. The highest outdoor illuminance was captured on midday between the periods of 11:00 h. to 13:00 h. Based on MBE indicator, the largest difference plotted in December and July on midday by 35%, 39.7% respectively. However, the daily average of the calculated MBE is less than 18%, which is consider within acceptable range . The coefficient of determination R2 shows a high consistency under CEI sky condition, it is percentage ranging from (88% to 97%), the lowest value is calculated in July with 83.5%. Therefore, the outdoor illuminance is reliable during the experiment. Fig. 5. 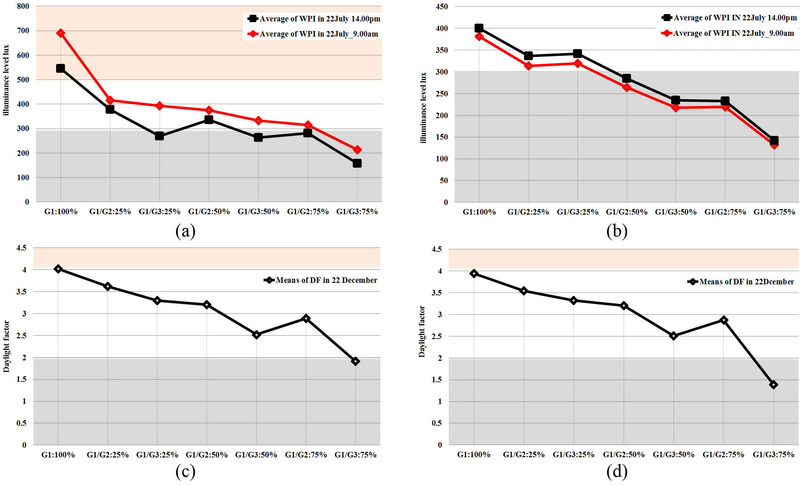 Comparison between IESVE outdoor illuminance simulation and field measurement of outdoor illuminance on 15 (a) October, (b) November, (c) December, and (d) July. From the measurements at summer solstice, it is clearly observed that there is excessive illuminance reaching towards 6689 lux in the classrooms facing south-north axis (bilateral lighting) that often leads to visual discomfort due to the saturation of light and even glare where close to the openings in all classroom directions. Moreover, the presence of sunlight patches and shadows are projected on the floor, walls, and tables. These sunlight patches evolved and changed position during the day and during different seasons of the year according to the angle of incidence of solar radiation. Direct sunlight is a source of visual discomfort and intensive heat, as expressed by teachers and students during the site visit. It is important to note those adjustments by occupants to achieve visual and thermal comfort, such as the manipulation of the curtains, moving the student to another table that is more comfortable and the incessant movement of teachers from one side of the room to another. In addition, visible coating on the bottom half of the windows on both sides of the classrooms were used to reduce the effect of glare. In both classrooms, the distribution of daylight illuminance diminished slightly with increasing distance from external windows, until the middle of the classrooms and then rose up again until it reached the corridor window. However, the illuminance value near the corridor window was less than the external window side because of the existence of an external shading device, which could provide significant improvement in the indoor daylight quantity and quality. 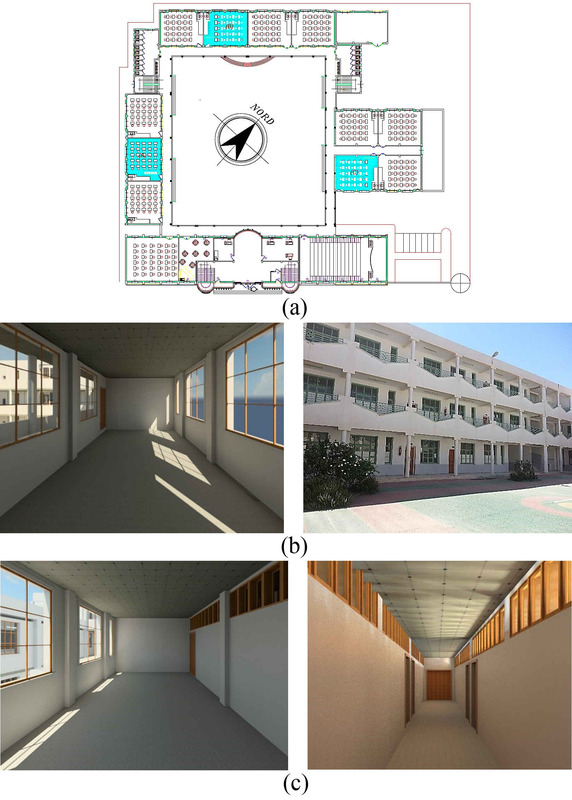 The classrooms (B, C) facing the east orientation due to the position of the sun in the morning allowed access to more illuminance, but the classroom (B) received less illuminance due to the presence of the overhang. Conversely, the classroom (A) oriented to the south-east façade recorded an excessive illuminance reaching towards 7000 lux due to penetration of direct light. For all classrooms (A, B and C), a seating position near the windows did not respond to the international standard (A.F.E) and was considered uncomfortable for visual performance due to the direct penetration of sunlight on work plane inside the classrooms. Once reviewing the daylight uniformity with a clear sky, it could be seen that all the classrooms achieved uniformity greater than 0.5, except the classroom A at 14:00 h. generated low uniformity of 0.42 because the greatest contrast corresponds to 14:00 h. between both sides of windows, as shown in Appendix A. The percentage of SIR throughout classrooms exceeded the reference value of 4%, which presented the risk of discomfort due to the saturation and the penetration of illuminance (Fig. 6). The exception was the classroom (C) oriented to the east-west with overhang, which had an SIR value of 3.96 due to the sun position and the protection from direct sunlight by means of an overhang on the east. The main reason behind these large amounts of daylight in both summer and winter solstice was the direct sunlight penetration through large windows (WWR more than 40%). In the winter, the illuminance level is around 700 lux, while in summer it reached up to 3000 lux. Furthermore, the usage of clear glazing with visible light transmittance (VLT) as high as 92% supplied the classrooms with large amount of sunlight. Fig. 6. Summary of distribution of (a) average daylight illuminance and (b) SIR of the classrooms tested at summer season. As shown in Fig. 7, in winter for classrooms A and B, the illuminance level on the seating position near the external window (Column 6) were high and did not respond to the international standard (A.F.E). Thus, they are considered uncomfortable for visual performance, except the classroom C which had almost achieved the required of illuminance level. On the other hand, the illuminance near to corridor windows (Column 1) was lower than the other side because of the presence of an overhang that reduced the quantity of daylight and improved the illuminance conditions within the classroom . The DF was considered the most appropriate factor for indicating the quantity of light admitted in. The effectiveness of the illumination on the system in an overcast sky (winter), as shown in Figure 7, the means of DF of each classroom tested on our measurements exceeded the reference value of 4%, which presented a risk of discomfort due to the saturation of illuminance. However, the classroom used bilateral clerestory typology oriented to the south-east obtains the better result among these classrooms; the uniformity in winter under an overcast sky achieved greater than 0.5. This means the bilateral typology achieved the optimal level of uniformity in addition to clerestory bilateral typology. Fig. 7. Summary of distribution of (a) average daylight illuminance and (b) average daylight factor on the tested classrooms at winter season. As a result, although the daylight in subtropical zones such as Algeria is sufficient to achieve the required illumination conditions in classrooms, it was not optimally exploited. Numerous causes behind these excessively high amounts of daylight include using large windows, in addition to the usage of clear glazing on windows in a subtropical climate, which is quite difficult to manage throughout the whole year, particularly in summer. The pattern A1 is the most unfavorable for north-south orientation because the average illuminance level was in the lowest values in winter in the morning period, which reached 131.5 lux through using 75% of reflective glass on daylight glazing Pattern B1. Figure 8 also showed an increase in the illuminance value in the afternoon period compared with morning period. Nevertheless, three window patterns obtained the range suggested by the AFE guideline which are the patterns 1, B1 and B2; clear glass G1:100% yielded 381.28-400.21 lux while clear with tinted glass Pattern A3 recorded 313.75-336.66 lux due to the use of a substantial percentage of clear glass (not less than 75%) on the North orientation. However, the pattern A2 achieved 284.4 lux. The other patterns are below the recommended value because of using reflective glass with a percentage higher than 50%. Fig. 8. Illuminance and daylight factor for glazing patterns in summer: (a) West-East and (b) North-South orientation and winter (c) North-South and (d) West-East with overhang season for classrooms. In winter season, it can be seen that both pattern 1 and pattern B1 did not respond to the guideline parameter. They were either too bright by using G1:100, or too dark by means of pattern B1. On the other hand, the maximum average illuminance of classrooms faced to east-west orientation was reached by the pattern 1which reached 689.77 lux in the morning. The average illuminance was inconsistent in the morning and afternoon in solstice summer and winter. The average illuminance for each pattern in the morning was higher than the same pattern in the afternoon. The east-west oriented classroom benefits from the morning sun but the solar radiation is then difficult to be controlled because the sun is at low angle at the horizon. In cases when there was no overcast sky during the winter months, the sunlight was not as strong but penetrated farther into the classroom than in summer when the sun was high in the sky. On the other hand, at summer solstice, the east orientation presented a higher solar exposure than the south orientation, therefore, there is a real risk of glare, and the sun can induce significant overheating. In order to select the optimum glazing windows configuration, Table 3 show the highest percentage of UDI for these glazing configurations which have north-south facing orientation in both solstice seasons. Patterns A3 and B2 are similar and achieved the highest percentage among other patterns. The pattern B3 recorded 42.00% - 41.54% in winter and 42.48% and 32.63% in summer in the morning and afternoon respectively. In addition, the pattern A2 recorded 42.54% - 42.55% in winter and 42.31 – 33.67% in summer. However, the view glazing of the pattern B3 offers a view to the outdoors better than the pattern A2. Therefore, the optimum glazing option for a north orientation is (G1+G3:25%). Table 3. Useful daylight area for windows design by changing glazing size (threshold) in classrooms facing North-South and East-West orientations in summer and winter. Using reflective glass within classrooms provides an excessive percentage of fair and dark area < 300 lux in summer. According to Table 3, in terms of glazing size the tinted glazing configurations, G1+G2 had the highest percentage of useful area of illuminance by using the pattern A2 in solstice winter and summer facing East-West. In overall, the usable area has an upward trend in fair area (DF < 2%) from 31.22% to 41.74% in winter and 31.22% to 41.74% in summer by increasing the percentage of tinted glass from 25% to 75%. The percentage of the bright area (DF > 4%) declined correspondingly by the augmentation of tinted glass from 25% to 75%, and rising dramatically to the peak percentage 17.91% of too bright area and 11.01% of thermal and glare area in winter and 28.94% in summer respectively, by using the pattern in the morning. In winter, under an overcast sky condition with changing glazing size from 25% to 75%, the useful daylight area had irregularity (respectively, 42.25% - 38.15% reduction) which means by increasing clear glazing size each of defined area does not increase with the same proportion. In summer, under clear sky conditions, the Table 4 indicates good area increased steadily by raising the percentage of tinted glass from 43.76% to 53.95% in the morning. However, the percentage of useful daylight area was inconsistent (19.27% - 10.40% reduction) due to the diminishing bright area and rising of fair area by increasing percentage of tinted glass. The percentages of usable fair area in the afternoon period were much higher than the morning period. The difference in percentage reached more than 40%. This means it was too difficult to control the day lit area within the classrooms facing the E\east-west axis at summer season during the day by using glazing system. However, the effectiveness of the overhang on the south orientation is obvious on the isolux contour images (Fig. 9); the bottom side of the image represents the northern side, and the upper side represent the southern part that enclosed by an overhang (shading device). Fig. 9. Isolux contour of the optimum glazing pattern in both summer and winter for daylighting distribution at different times of the day based on simulation of typical model Algerian classroom. Table 4. Distribution of DF for windows design by changing glazing size (threshold) in classrooms facing north-south and east-west orientations in summer and winter. As revealed in this study, the WWR more than 40% does not ensure the adequate levels of lighting because, in most of the studied cases, we obtained too much light, i.e. illuminances “too high” throughout the year. Because of this, this study concludes that it is necessary to include more variables to ensure better lighting conditions for the students. A 30% WWR should be used for all public schools, which are in line with the Algerian guideline recommendations. The optimum window glazing pattern facing to north and east orientations that achieved the highest percentage of useful daylight area within the classroom is Pattern B3 (G1+G3:25%), thus it is recommended to be used for classroom design guideline in Algeria public schools. A bilateral typology for public school should be used to achieve an adequate daylight uniformity > 0.5, and optimal distribution. The recommended orientation for bilateral typology classroom in Algeria public school is South-East axis. Furthermore, north-south axis should provide by external shading device. This research was financed by Professor Mesloub Said Department Mathematics King Saud University, College of Sciences P. O. Box 2455; Riyadh 11451 Saudi Arabia. M. Abdelhakim conceived the study, performed all measurements and simulations, interpreted the results, and wrote the manuscript. M. Z. Kandar supervised with help each stage of the project in terms of data collection, analysis and interpretation. Y.-W. Lim provided constructive advice to shape the final manuscript. Fig. A1. The uniformity of daylight in both typology (bilateral and clerestory lighting) in different orientations at solstice (a) summer and (b) winter. Fig. A2. Section of tested classrooms used in the experiment for measurements. D. Rouag-Saffidine, Daylight: a Recurrent Source of Conflict in Learning Enclosures under Clear Skies. Adjunct proceedings experiencing light 2009: pp. 29. P.R. Boyce, Human factors in lighting. 2014: Crc Press. P. Andersen, R. Foldbjerg, Daylight, Energy and Indoor Climate Basic Book. Editorial team: Daylight Energy and Indoor Climate (DEIC), VELUX A/S, 2012, pp.18. M. Abdelhakeem, D.Y. Aminu, and M.Z. Kandar, Investigating use of daylight in a typical algerian public classroom typology. Jurnal Teknologi, 77 (2015) 21-30. J.L. Hensen, R. Lamberts, Building performance simulation for design and operation, 2012, Routledge. D. Andersen, R. Foldbjerg, Daylight, Energy and Indoor Climate–Basic Book. Editorial team: Daylight Energy and Indoor Climate (DEIC), VELUX A/S, 2012. J. Mardaljevic, et al. Daylighting metrics: is there a relation between useful daylight illuminance and daylight glare probability, in Proceedings of the building simulation and optimization conference (BSO12), Loughborough, UK. 2012. V. Costanzo, et al., Static and dynamic strategies for improving daylight use in side-lit classrooms: A case study, Proceedings of the BSA, 2017. N. Petermann, Research Tool Dissemination to Increase Energy Efficient Fenestration Product Penetration -The Efficient Windows Collaborative Tools for Schools-, in Final Technical Report Prepared for the U.S. Department of Energy by the Alliance to Save Energy 2011, Regents of the University of Minnesota, Twin Cities Campus, Center or Sustainable Building Research, USA, 2011. H. Hellinga, Daylight and view: the influence of windows on the visual quality of indoor spaces, 2013, TU Delft, Delft University of Technology. J. Carmody, et al., Window System for High-Performance Buildings, 2004, W. W. Norton & Company. N.T. Al-Ashwal, A.S. Hassan, The Impact Of Daylighting -Artificiel Lighting Integration on Building Occupant's Health and Performance . International Journal Transaction Journal of Engineering Management & Applied Sciences & Technologies 9 (2018) 97-105. A. Gilavand, M. Gilavand, and S. Gilavand, Investigating the impact of lighting educational spaces on learning and academic achievement of elementary students, International Journal of Pediatrics 4 (2016) 1819-1828. A. Demir, A. Konan, Impact of daylighting on student and teacher performance. Journal of Educational and Instructional Studies in the World 3 (2013) 7. P. Tregenza, M. Wilson, Daylighting: architecture and lighting design. 2013: Routledge. C.K. Tanner, Effects of school design on student outcomes, Journal of Educational Administration 47 (2009) 381-399. A.D. Mathalamuthu, et al., Illuminance Uniformity Using Public Works Department (PWD) Standard Design for Public Schools Classroom Design in Malaysia, Journal of Advanced Research in Fluid Mechanics and Thermal Sciences 52 (2018) 205-214. AFE Association française, Relatives recommendations of daylighting in schools. 1998, Paris (52 Bd Malesherbes, 75008): Society d'éd. Lux. Y.W. Lim, M.H. Ahmad, and D.R. Ossen, Empirical validation of daylight simulation tool with physical model measurement, American Journal of Applied Sciences 7 (2010) 1426. N. Zemmouri, Achieving Environmental Security: Ecosystem Services and Human Welfare, 2010, Department of architecture, University of Biskra, Algeria. D.S. David Hansen, National Best Practices -Manual For Building High Performance Schools- D.o. Energy, Editor, Department of Energy, U.S., 2007. C. Reinhart and P.-F. Breton, Experimental validation of Autodesk 3ds Max Design 2009 and DAYSIM 3.0., Eleventh International IBPSA Conference, 2009, Glasgow, Scotland.